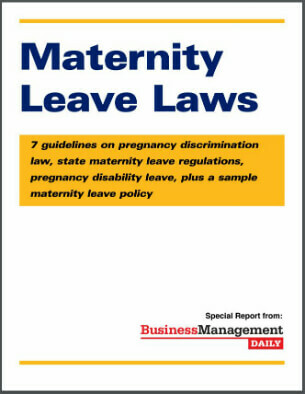 Claim your FREE copy of Maternity Leave Laws: 7 guidelines on pregnancy discrimination law, state maternity leave regulations, pregnancy disability leave, plus a sample maternity leave policy! Maternity Leave Laws helps employers comply with federal pregnancy discrimination law and state maternity leave laws. Find out when an employee is entitled to pregnancy disability leave with this new report from Business Management Daily, publisher of The HR Specialist and HR Specialist: Employment Law. Don’t forget to look at our sample maternity leave policy so you don’t end up facing a potential pregnancy discrimination case of your own! It’s important to know what you must do—and what you can’t do (or say)—under federal anti-discrimination and maternity leave laws. Plus, it’s vital to double-check state maternity leave statutes, which may provide more liberal leave benefits. While no federal law requires you to provide paid maternity leave, most employers must comply with the pregnancy discrimination law and FMLA maternity leave regulations. Here are 7 guidelines on how best to comply with maternity leave laws, plus a sample maternity leave policy you can adapt for your own organization. The Pregnancy Discrimination Act (PDA) prohibits discrimination against employees and applicants on the basis of “pregnancy, childbirth and related medical conditions.” Any employer that’s subject to Title VII of the Civil Rights Act of 1964 (i.e., has 15 or more employees) must comply with the PDA. The pregnancy discrimination law requires you to treat pregnant employees the same as other employees on the basis of their ability or inability to work. That means you must provide the same accommodations for an expectant worker that you do for any employees unable to perform their regular duties. Learn about other key PDA provisions in Business Management Daily's free special report Maternity Leave Laws. You will lose a pregnancy discrimination case unless you can clearly prove that the reasons for not hiring or for discharging the plaintiff were unrelated to her pregnancy. Caution: Singling out pregnant employees for any reason can lead to a pregnancy discrimination lawsuit. If supervisors make little jokes about pregnancy and childbirth, rein them in. When an employee becomes pregnant, her employer must also consider her right to take FMLA leave. To qualify for FMLA leave, an employee must have worked for the same employer for at least 12 months (not necessarily continuously) and clocked at least 1,250 hours of service (slightly more than 24 hours per week) during the 12 months leading up to FMLA leave. Any organization with 50 or more employees working within a 75-mile radius of the work site must comply with the FMLA. A normal pregnancy is not considered a disability under the Americans with Disabilities Act (ADA). But if a woman experiences pregnancy complications that substantially limit a major life activity, she may be considered disabled under the ADA and, therefore, entitled to reasonable accommodation to perform her job. All employers that have 15 or more employees must comply with the ADA. • Tennessee: Public and private employers that have eight or more workers must maintain a maternity leave policy that allows female employees 16 weeks’ leave for childbirth. • Rhode Island: Public employers of 30 or more employees and private employers with 50 or more employees are required to offer 13 weeks of state maternity leave in any two calendar years for the birth or adoption of a child or the serious illness of a child, spouse or parent. California’s provisions on pregnancy disability leave cover employers with as few as five employees. The leave is capped at four months. But it’s important to note that pregnancy disability leave comes in addition to leave taken under the California Family Rights Act (covering employers with 50 or more employees). So an employee covered by both laws could take four months of pregnancy disability leave and then 12 weeks of family leave to care for a new child. Find out how to access your state’s maternity leave laws in Maternity Leave Laws. In a 2011 Employee Benefits Research Report by the Society for Human Resource Management, about 70% of the HR professionals polled said their organizations offer short-term disability benefits. But only 16% said they have a separate, paid maternity leave policy (compared to 12% in 2006). Also, only 16% said they provide paid paternity leave (versus 13% in 2006). It’s also up to each employer to decide how many weeks of paid leave to offer. If you decide to adopt a formal maternity/paternity leave policy, make sure it complies with federal and state regulations. Since some state maternity leave laws grant employees more generous leave and may apply to smaller employers than the FMLA, make sure your attorney reviews your policy before you disseminate it to employees. The EEOC has developed a series of questions and answers that clear up most of the ambiguities in the Pregnancy Discrimination Act. Find a sampling of frequently asked questions on hiring and on-the-job rules, health and disability insurance, and abortion policies in Maternity Leave Laws.